President Lincoln’s Cottage at the Soldiers’ Home in Washington, DC gives Americans an intimate, never-before-seen view of Abraham Lincoln’s presidency and family life. Lincoln’s Cottage was designated a national monument by President Clinton in 2000 and was restored by the National Trust for Historic Preservation at a cost of over $15 million. 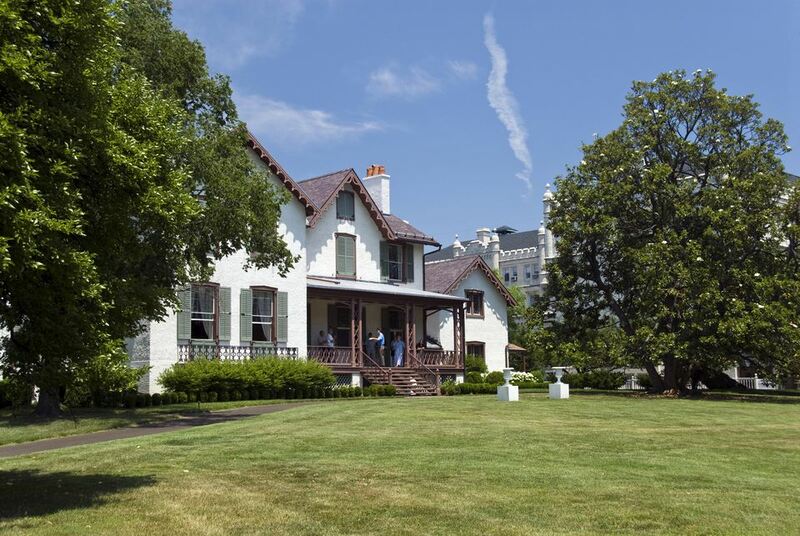 The cottage served as Lincoln’s family residence for a quarter of his presidency and is deemed “the most significant historic site directly associated with Lincoln’s presidency” aside from the White House. Lincoln used the cottage as a quiet retreat and crafted important speeches, letters, and policies from this site. Abraham Lincoln lived in the Cottage at the Soldiers' Home from June-November of 1862, 1863 and 1864. He was living here when he drafted the preliminary version of the Emancipation Proclamation and deliberated critical issues of the Civil War. Since the Cottage opened to the public in 2008, tens of thousands of visitors have engaged in conversations on liberty, justice, and equality, through innovative guided tours, forward-thinking exhibits, and quality educational programs. A one-hour guided tour of the Cottage is offered daily, on the hour every hour from 10:00 a.m. – 3:00 p.m. Monday – Saturday and 11:00 a.m. – 3:00 p.m. on Sunday. Reservations are strongly recommended. Call 1-800-514-ETIX (3849). Tickets are $15 for Adults and $5 for children ages 6-12. All tours are guided and limited space is available. The Visitor Center is open 9:30 a.m.-4:30 p.m. Mon-Sat, 10:30 a.m.-4:30 p.m. Sunday. The Visitor Education Center, located in a restored 1905 building adjacent to Lincoln’s Cottage, features exhibitions that tell the story of wartime Washington, the Lincoln family’s discovery of their country retreat at the Soldiers’ Home, and Lincoln’s role as Commander-in-Chief. A special gallery features rotating displays of Lincoln-related artifacts. Nestled on 272 acres in the heart of our nation’s capital, the Armed Forces Retirement Home is a premier retirement community fostering independence for veteran airmen, Marines, sailors and soldiers. The property features more than 400 private rooms, banks, chapels, a convenience store, post office, laundry, barber shop and beauty salon, and dining room. The campus also has a nine-hole golf course and driving range, walking trails, gardens, two fishing ponds, a computer center, a bowling alley and individual work areas for ceramics, woodworking, painting and other hobbies. The Armed Forces Retirement Home was established on March 3, 1851, and later became a presidential retreat. President Lincoln lived at the Soldiers’ Home in 1862-1864 and spent more time there than any other president. In 1857, President James Buchanan became the first president to stay at the Soldiers’ Home, although he stayed in a different cottage than the one occupied by Lincoln. President Rutherford B. Hayes also enjoyed the Soldiers’ Home setting and stayed in the Cottage during the summers of 1877-80. President Chester A. Arthur was the last president to use the cottage as a residence, which he did during the winter of 1882 while the White House was being repaired.